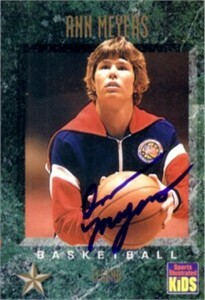 1994 Sports Illustrated for Kids card with typical perforations autographed in blue marker by Hall of Famer Ann Meyers (pictured in what appears to be 1976 U.S. Olympic Team warmups). ONLY TWO LEFT. With certificate of authenticity from AutographsForSale.com.